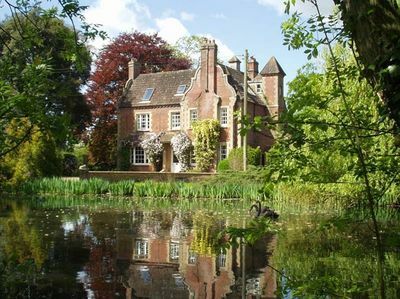 An inexpensive B&B: Abbey House, a listed Victorian Rectory, is in an idyllic setting surrounded by ten acres of secluded garden and meadowland. The house lies hidden amongst the many magnificent old oak, beech and lime trees in the grounds. The light and spacious bedrooms are comfortably furnished and look out onto the garden with its sweeping lawns, shrub walk and pond, home to an abundance of wild fowl and black swans. A heated outdoor swimming pool, which is available for the use of guests, can be found in a quiet sunny corner of the garden. The house has double bedrooms for guests each with a private or en-suite bathroom and tea making facilities. Guests have exclusive use of the dining room and drawing room with its log fire and French windows that open on to the terrace and garden.